ABSTRACT: Class is conceptualized in diverse ways. It can be a process of surplus extraction and distribution, a position in a hierarchy of wealth, a performance of distinction, and a collective politics of resistance to economic marginalization. 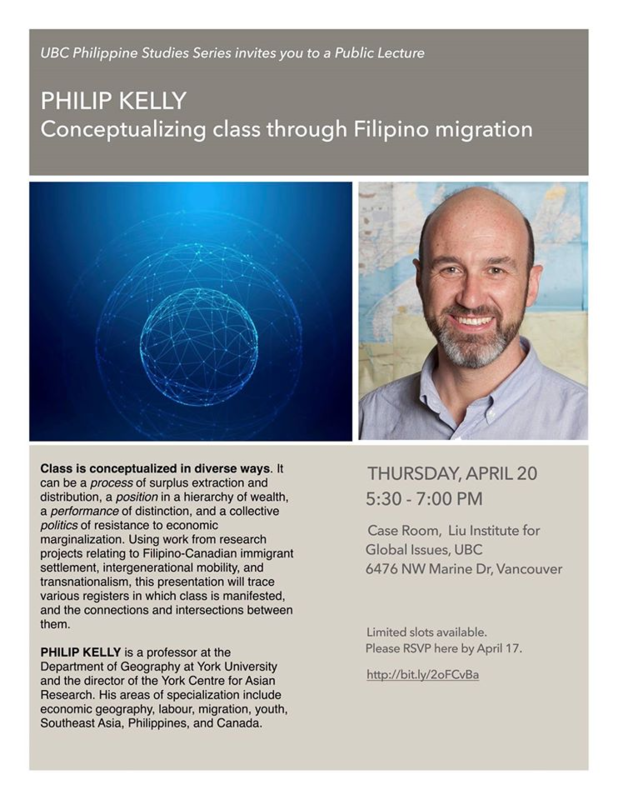 Using work from research projects relating to Filipino-Canadian immigrant settlement, intergenerational mobility, and transnationalism, this presentation will trace various registers in which class is manifested, and the connections and intersections between them. The specific research to be drawn upon includes: the GATES project on live-in caregiver settlement trajectories, conducted in collaboration with GABRIELA-Ontario; the Halton Pinoy Project with high school youth in the Halton Catholic District School Board; the Precarious Employment and Poverty in Southern Ontario (PEPSO) project, looking at arts-based activism by live-in caregivers; and, the Canada-Philippines Alternative Transnational Economies (ATE) project, seeking to find and foster diverse solidarity economies between the two countries. These explorations of economic marginalization and mobility in the Filipino community allow the recognition and theorization of class in its various dimensions. Tags: Canada, Migration, Philippine Studies. Bookmark the permalink.